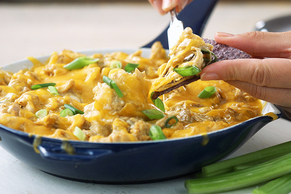 Bring together chicken and a homemade Buffalo wing sauce for this Buffalo So-Good Chicken Dip! 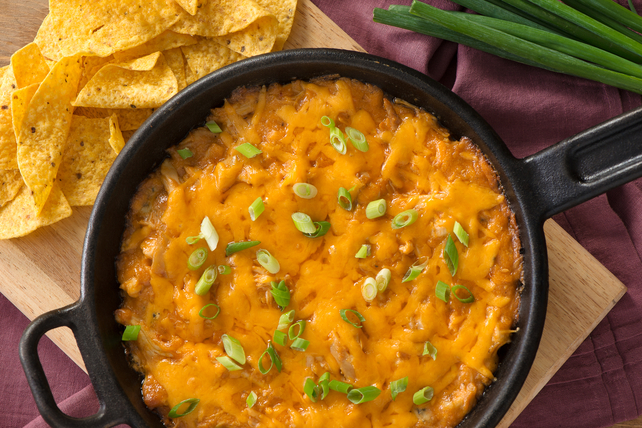 You're sure to wow the crowd with this cheesy easy-to-make dip. Combine blue cheese, mayonnaise, barbecue sauce and 1/2 cup cheddar in medium bowl. Add chicken; mix lightly. Spoon into shallow 1-L casserole dish sprayed with cooking spray. Bake 15 min. Top with remaining cheddar; bake 5 min. or until melted. This flavourful dip can be prepared ahead of time. Before sprinkling with the green onions, pour hot dip into slow cooker or fondue pot; sprinkle with onions. Set on LOW heat to keep the dip warm while serving.